Consent is one of the six lawful bases that you can use for processing personal data. This eblast explains when it is appropriate to use consent as the legal basis and how to obtain, manage and refresh consents. 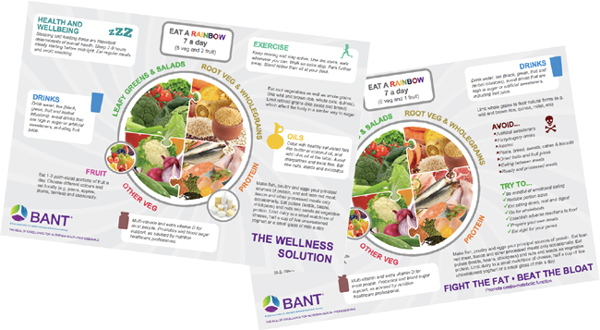 BANT has produced an example Consents Form for a typical nutritional therapy business that can be adapted by members for their own businesses. Being transparent and providing accessible information to individuals about how you will use their personal data is a key element of the General Data Protection Regulation (GDPR). The most common way to provide this information is in a privacy notice. BANT has drafted an example privacy notice for a typical NT business that can be adapted by members. BANT (British Association for Applied Nutrition and Nutritional Therapy) is delighted by the news that the Government is planning a u-turn in policy relating to banning junk food advertising and two for one promotions. Just yesterday BANT called out for a different approach to the obesity crisis following the baffling decision by Public Health England to launch a campaign focusing on the outdated nutrition science of calorie counting, coupled with quotes from senior PHE members highlighting how processed food offerings can be selected to fall within the calorie limits and with no mention of simple, wholesome ingredients and home cooked fare. Contrary to PHE, BANT suggests: the reintroduction of home economics classes in school; education about healthy eating; how diet and lifestyle can influence health over the short and long-term; and promotion by Government Agencies of the consumption of healthy ingredients and unprocessed food. This policy u-turn is the first step in the right direction and will set the background for establishing the changes needed to engender a long-term cultural shift which allows healthy behaviour adaptations to an environment that offers so many opportunities for unhealthy indulgence either knowingly or in ignorance. The causes of obesity are multifactorial and can include increased stress levels, systemic low-grade inflammation, lack of exercise, and choice of foods and their preparation/cooking methods, amongst others. There is growing evidence that minimally processed foods like non-starchy vegetables and fruit are more satiating and elicit less of a glycaemic response than ultra-processed foods, so prevalent in typical British diets. Additionally, minimally processed foods are associated with a decreased risk of cardio-metabolic disease. 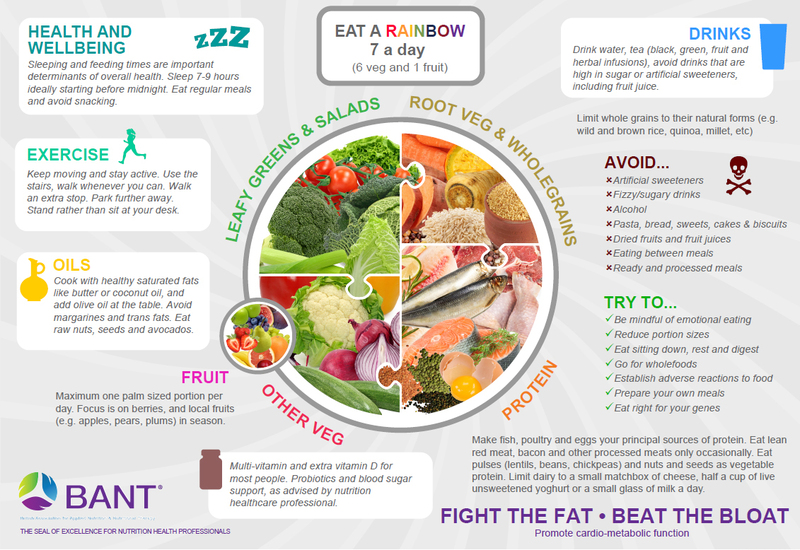 BANT continues to promote its Wellbeing Guidelines campaign to encourage the British people to eat more individual ingredients and unprocessed food. Going back to some old-fashioned values, such a family meal times, and improving the nations cooking skills to use fresh ingredients, will go a long way to help the obesity targets and health of the individuals. BANT Registered Nutritional Therapy Practitioners are regulated by the Complementary and Natural Healthcare Council (CNHC) that holds an Accredited Voluntary Register (AVR) for the Professional Standards Authority for Health and Social Care (PSA). A recent report by the Royal Society for Public Health and the Professional Standards Agency made a key recommendation that AR practitioners have the authority to make direct NHS referrals, in appropriate cases, to ease the administrative burden on GP surgeries. As members of the CNHC Accredited Register, BANT Registered Nutritional Therapy Practitioners and other CNHC registrants, are the key workforce asset to harness 21st century lifestyle medicine to tackle the rising tide of stress related fatigue, obesity, Type 2 Diabetes, dementia and other chronic diseases. BANT (British Association for Applied Nutrition and Nutritional Therapy) is baffled by Public Health England’s new ‘One You’ campaign focusing on the scientifically old-fashioned notion of calories. It is well established that calorie counting is difficult to manage in supporting people looking to lower their risk of obesity. Calorie counting takes little to no account of the nutritional values of different foods and their relation to health and is problematic for those at risk of eating disorders. Not for the first time BANT is asking “why promote a campaign that leads the population to rely on calorie defined processed foods, rather than simple, wholesome ingredients?”. Humans don’t think in calories and the risk is that PHE is encouraging the very people who may need to modify their eating habits, to rely on processed offerings, due to calorie figures being highlighted on packets. The question that needs to be answered is why PHE doesn’t promote wholefood and individual ingredients, when evidence-based nutrition science continuously highlights the benefits, not only in weight management, but also overall health? The continual tinkering of out-dated nutrition science is putting the health of the British nation at risk and is contributing to the current National Health Service crisis. The OECD 2017 obesity rankings classified the UK as the sixth most obese nation in the world, a truly dubious honour. Obesity and its related conditions are complex issues which require interventions at multiple levels to achieve both effective prevention and successful treatment, and this is putting an unbearable and unwarranted burden on NHS. 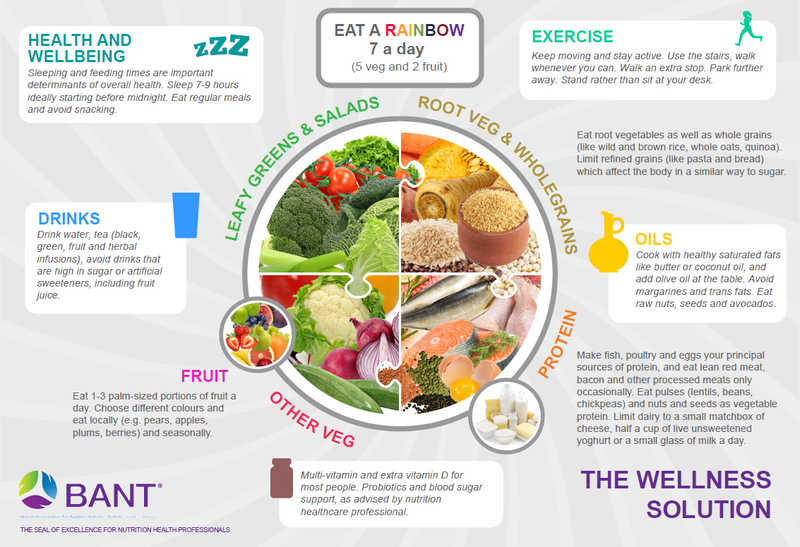 BANT continues to promote its Wellbeing Guidelines campaign to encourage the British people to eat more individual ingredients and unprocessed food. BANT also continues to call for some grass-roots changes to the approach to the Obesity Crisis: the reintroduction of home economics classes in school; education about healthy eating; how diet and lifestyle can influence health over the short and long-term; and promotion by Government Agencies of the consumption of healthy ingredients and unprocessed food. “BANT members can support the health of children on the autistic spectrum by means of the practice of Nutritional Therapy. However, BANT members do not treat autism. BANT is in no way affiliated with organisations such as Autism Research Institute (formerly Defeat Autism Now! or “DAN!”) or Gut and Psychology Syndrome (GAPS). It does not accredit their educational programmes nor does it endorse their recommended protocols. BANT requires its members to assess individual requirements for each of their clients and not to follow a “one-size-fits-all” approach for any given condition.